No awards will be given to guest class shooters. Awards will be given to OAA and USA Archery members per sections three through six below. 1st, 2nd & 3rd place medals will be awarded to all classes. 1st, 2nd & 3rd place medals will be awarded to all 17 and under classes. 1st place trophy and 2nd & 3rd place medal to all 18 and over classes. 1st, 2nd & 3rd place medals for flights other than the first flight. Team or couple event awards per unit rule*. The first place team will receive one (1) trophy and each participant will receive a first place medal. The 2nd & 3rd place teams (if applicable) will receive a medal for each participant. All Pee Wee shooters will receive a participation award. The winner in each class at the Indoor 300 Championship and the Field Championship shall receive a State Champion patch along with tournament awards. Any archer, who is eligible for awards, that sets or ties a state record will receive a Record Holder patch along with announcment of award at statewide tournaments. Classes at any tournament with 15 or more shooters will be flighted. The NFAA flight system will be used per NFAA Appendix 1; >200 shooters regardless of actual number of participating shooters. Should a tie appear at a flight break, the archers tied will be placed at the bottom of the upper flight, without disturbing the remaining flights as originally established. NFAA rules will be utilized for resolving ties at the Indoor and Outdoor Championship. For first, second and third place ties in the first flight at statewide tournaments, a shoot-off will take place to determine final placement. Double awards will be given for all other ties. Ties for all mail-in tournaments (Indoor Bowhunter, Vegas 450 and Flint Round) will be broken in the following manner. First tie breaker is the greatest number of recorded X's. If tied with the same total points and same x count, the archer who drops their first point, if in an earlier end will be declared the lower place. If tied with the same total points, same x count, and both dropped their first point in the same end, the archer who drops their first x, if in an earlier end will be declared the lower place. If still tied, the tie shall be recorded. There will be two additional boxes on the scorecard and spreadsheet filled out by the scorekeepers and submitting host. First box is for the end of the first dropped point, second box is for the end of the first dropped X.
Mail-in tournament results will be posted as unofficial for a period of 48- hours and any correction must be submitted to the OAA Secretary within this timeframe. Upon completion of this 48-hour period, mail-in results will be final and no corrections will be made. For statewide tournaments corrections cannot be made to an archer’s scorecard once signed and turned in. Any shooter who wishes to make a formal challenge may do so per the challenge rules found in the General Rules Section. The OAA Super Slam award is open to OAA members (Ohio NFAA members) in good standing only. Members of USAA and other state NFAA chapters are not qualified to participate. To qualify for the award, the individual must take first place “Gold" medals in all seven tournaments during the year in the same class. There is no "two Eligible Archers” rule for this event. 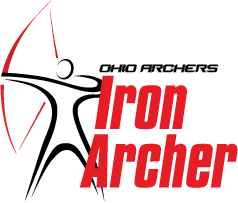 Any archer who competes in all 7 tournaments during the yearwill be entered into a drawing to win a free NFAA/OAA membership for the upcoming archery season. The OAA will choose 5 different Iron Archers. OAA Executive Board Members are exempt from this drawing. *The unit rule is defined as follows: One award for one through three teams or couples; two awards for four through six teams or couples; three awards for seven or more teams or couples.